One of the most popular pike baits and the best one to try first on a new venue. Readily available from most good tackle shops, fishmongers and supermarkets and quite cheap. An oily bait which emits a strong aroma with a tough skin meaning they can be cast some distance without coming off. A great gravel pit bait. It's thought the pike might mistake their markings for small jack pike. The most natural deadbait which will catch all predators. Freshly-killed small roach are the best for zander and perch. Slashing the flanks helps the juices out. Half a roach, either head or tail, is a good eel bait. For pike, choose a fish matching the average size of the roach in the venue you are fishing. In clear waters they are great fished sink-and-draw style, hooked with the top treble through the head and the bottom treble through the flank. Dead fish used to catch predators like pike, zander, perch, eels and catfish. As predators get bigger, they become less agile and less inclined to chase live fish, turning to scavenging for dead fish on the bottom. Thus deadbaiting is a good way to try and single out a specimen. Zander and perch will usually not take sea deadbaits. Basically groundbait in its many forms is used to draw fish into your peg and hold them there. Once mixed (by adding water) it’s either fed in balls by hand, through a groundbait catapult in balls at distances beyond about 15 metres, or through and open ended feeder as far as you can cast. In its simplest form, groundbait is dried and crushed bread, called 'crumb', which is available in white and light brown. Plain brown crumb laced with chopped worms and squatts is a superb mix to put through a feeder for bream fishing. Things become more complicated when you move to ‘Continental’ groundbaits. These contain all sorts of weird and wonderful ingredients designed for use in varying conditions to attract different species and to behave in all manner of ways. Luckily for the newcomer the groundbait’s intended use is usually stated on the packaging - ‘Tench’, ‘Carp’, Feeder’, ‘Cloud’ and so on. The big groundbait firms - Sensas and Van den Eynde - keep the actual ingredients of their various mixes secret, and who can blame them? There can't be too many other businesses where the customer pays £2 for a product which he immediately throws away! Generalising is very difficult, but before you buy a groundbait you should think about what you want it to achieve. If, for instance, you are going to try and catch fish in the upper layers you need a groundbait which breaks up as soon as it hits the surface and creates a cloud. If you are fishing a fast, deep river you need a groundbait that binds together well and only start breaking up when it’s on the bottom. The weather must be taken into account too, and the condition of the water you are fishing. In winter, venues are often clear and fish not very active. It doesn’t take much to fill them up and so you need a fine groundbait and in clearish water a dark mix is best. Van den Eynde Supermatch or Sensas Noire are excellent. In summer however when fish like carp are active, you need a groundbait with lots of particles which will keep fish rooting about in your peg, and a coarse groundbait like Sensas Carp would be good. You can also get any mix to behave differently just by varying how much water you add. The drier the mix, the quicker it will break up on contact with water. Generally speaking, you are looking to create a mix which will hold together for feeding but will break up close to the bottom. It should be said that groundbait can be the kiss of death on some venues, especially clear ones where loosefeeding maggots can be much better. It pays to ask the local tackle dealer his advice if you are fishing a new venue. Fishing with live fish for predators is not banned by law, but it is frowned upon by some. However, there are occasions when livebaiting is the only way to catch, especially on hard-fished venues. Livebaits commonly used include roach for pike and zander, gudgeon for big perch, and trout on trout reservoirs for large pike. Trout venues which permit livebaiting only allow you to use live trout baits sold at the venue. It should be noted that it is illegal to transport any live fish from one venue to another. This law is in place to prevent the spread of disease. Livebaits over three inches long are generally presented on hook traces encorporating two treble hooks, or "snap tackles" as they are sometimes known. The best are semi barbless, using trebles with one barbed hook to hold the bait on, and two barbless hooks for hooking the fish cleanly and unhooking it quickly. They should always be fished in conjunction with a wire trace as pike can easily bite through mono line and that would leave treble hooks in their mouth. Small livebaits can be fished with a large single hook through the lip of the fish. Whilst a deadly method, deadbaiting is often the way to pick up the largest predatory fish, which have become less agile and therefore turn to scavenging for food rather than actively hunting it. A metal blade revolves around an axis sending vibrations through the water, flashing as it goes. They should be retrieved slowly and steadily. Look for spinners with integral casting weight around the axis. The traditional blade spinner patterns are typified by the French Mepps and Vibrax patterns and the ABU 'Droppen' and 'Reflex'. Sizes range from 0 to 4 on the Mepps size system (up to about 15gm) and blade colours are usually metallic silver, gold, copper or black, either plain or decorated with spots or stripes of various colours. Mepps in the smaller sizes (00 to 1) are fabulous perch and chub catchers, with larger sizes good for zander and small pike and game fish. Plastic/wooden lures which float until you start winding in, when the lure starts working underwater at a depth governed by the vane at the front and speed of retrieve. A large, low-angled vane indicates a deep diver, a smaller, sharply-angled vane signals a shallow working plug. Fished by varying the speed of retrieve, which makes the lure wobble and work from side to side, and called ‘crank baits’ in America. Good floating divers include the Rapala Shad Rap and the Shakespeare Big S.
Large, specialist, wooden lure designed to catch big predators. Fished with short, powerful rod and heavy braid. The angler puts most of the action into the lure by ‘cranking’ hard. Can be floating, sinking or shallow diving. Expensive and not one for the beginner. These are plugs which sink when cast in, so they are easy to lose! the depth they work at depends on how long you allow them to sink and how fast you retrieve. Can be jointed. Good for deep water venues like gravel pits and reservoirs. A famous sinking diver is the Creek Chub Pikie, the lure which caught the British record pike. These don’t look like anything alive, but they catch lots of fish. They were developed in the US for freshwater bass but catch plenty of zander and pike here. The real beauty is that they move along with the large single hook pointing up, and so can be bounced slowly along the bottom without fear of snagging up, making them great in snaggy swims or for winter fishing when fish are more docile and tend to rest up on the bottom. With their brightly coloured ‘tails’, they are also a good choice in slightly-coloured water. Basically spoons are a piece of metal with a hook at one end and a swivel at the other. They cast well, and wobble on the retrieve like an injured fish, reflecting the sunlight as they go. Good for covering a lot of water and should be retrieved at various depths by varying the speed all the time. Top spoons include the Kuusamo Professor. In traditional salmon fishing, an alternative to the Devon types of lure is the wobbling bar spoon typified by the ABU Toby and the Blair/Harkin patterns. Fished in much the same way as Devons, spoons do not require the same anti-kink measures as they are supposed to wobble and flutter rather than spin. They are fished in sizes from about 2.5 inches to 5 inches and up to about 30gm. Colours are typically plain silver, gold, copper (or combinations); or black/gold 'zebra' stripe, or blue/silver combinations. Plastic or wooden lures which float and work on the surface creating havoc as they go. Also knows as ‘poppers’, these catch a lot of pike and are great fun fished in shallowish, clear venues close to weeds and reeds. Takes are usually spectacular as the fish crashes through the surface layers as it takes the fish. Most don't look like anything a pike would normally eat, but all the predator sees is a silhouette on the surface and they probably think they are attacking a duckling, frog or water vole. They often have great names like the Heddon Crazy Crawler, Jitter Bug and Heddon Zara Mouse. The larvae of the bluebottle. Bronze maggots are especially popular for river fishing, red is excellent for perch and white is the best colour for big roach. The larger the black spot near the point of the maggot, the fresher and better the bait. 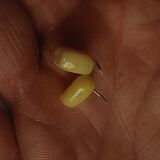 Sold in pint, half pint and quarter pint measures and the tackle dealer should add a flour-like fine maize to the maggots to degrease them so that they sink faster. Maggots should be hooked by lightly piercing the blunt end just through the skin. Hook size 16-20. Cheap, popular summer bait which can be used straight from the tin and loved by big fish, in particular carp, barbel and tench. Ready-flavoured and coloured brands are available so you can use anything from red, strawberry flavoured corn, to orange Tutti Frutti corn. Liquidised corn also sold in tins, but the unflavoured variety straight from the tin is hard to beat. Should be hooked so the point shows through the skin. Good for pre-baiting and the sweet juice can be added to the water you mix your groundbait with. Hook size: one grain on a size 16, two on a 12 etc. Medium-sized worm and the cheapest to buy. The best worm for chopping up and feeding neat of with casters for perch or in groundbait when bream fishing. For the hook it's best to fish a one ot two inch long piece of a dendra, hooking at the cut end. Hook sizes 10-16. Very small pieces of dendras can be superb for skimmers. An excellent floodwater bait for big river fish like chub and big roach. Can be collected at night from lawns on a wet night. Injecting air into the head of the lobworm above the saddle pops it up enticingly off the bottom - a very good method for big perch. Hook through the head. Hook sizes 6-10. Quite easy to collect from compost heaps, the redworm is a first class bream bait when tipped with a maggot or caster. Triple world champion Bob Nudd likes to hook these by cutting in half and hooking through both cut ends, theorising that the fish home in on the cut (hook) end which is letting out all the lovely juices. Hook sizes 14-18. The chrysalis stage before a bluebottle maggot becomes a fly and a particularly good bait for picking off bigger fish. When maggots first 'turn' the caster's shell is pale and the caster sinks, but it turns dark when left in open air and becomes a 'floater'. They can be stopped from turning into floaters by being kept in water or sealed in an air-tight bag. Casters should be threaded onto the hook through the blunt, tail-end resulting in a "buried" hook and superior presentation. Alternatively if the fish are feeding freely the caster can be hooked in a similar fashion to the humble maggot. Hook size 16-18. The fresh, white flake from an uncut loaf is a wonderful big fish hook bait, especially on chub, dace and big roach rivers in winter, and also for mullet in harbours and estuaries. Just fold a pinch around the shank of a size 8-14 hook and squeeze to clamp it in place, making sure the hook point is showing and that it’s still ‘fluffy’ around the bend of the hook. Fished with mashed bread as feed and best when there is just a touch of colour in the water. The hook bait should be struck off at the end of each cast to keep feeding the swim gradually. A vast number of bream anglers prefer using a paternoster rig when legering. It’s a simple rig and, because there are no swivels or beads linking mainline to hooklength, it is very resistance-free to taking fish. There are a couple of rules to adhere though. Firstly the length between the four-turn water knot and base of the feeder must be shorter than the length between four-turn water knot and the hooklength knot. This helps prevent tangles. Secondly, the paternoster link must be made up using line of a lighter breaking strain than the mainline. If you were to snag the feeder and have to pull for a break the paternoster link would snap first. The snap swivel allows a quick change of feeder is you need to step up, or down, on the feeder or switch to a bomb.